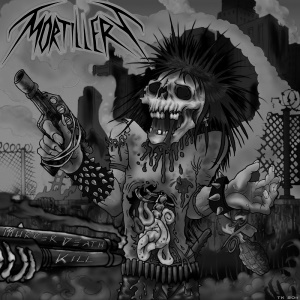 The last time I have enjoyed a new Thrash Metal album as much as Mortillery‘s „Murder Death Kill“ (and its follow-up „Origin of Extinction“) must have been more than 20 years ago. So, when they announced that they‘d tour in Europe supporting Sepultura, I was very happy to find out that they would also play in Germany. I bought a ticket for the first show of this tour in Bochum on February 7th, 2014. Even though I was inside the venue about 5 minutes before the concert should start (6.30 p.m.) – on my way there had got stuck in a few smaller traffic jams -, Mortillery had already started playing. However, I think I got to see another 25 minutes, so I suppose I didn’t miss too much. The sound was good and I really enjoyed the show. I don’t remember all the songs they played, but „No Way Out“, “Maniac” (one of my faves from the current album) and “I Am Destruction” (which – in spite of being one of the strongest new songs – is only to be found on the vinyl version of “Origin Of Extinction”) were among them, as well as a new song, “Radiation Sickness” (no, not a Nuclear Assault cover), which will be featured on their third album. My first impression of the new song was very positive. After Mortillery had left the stage, I headed for the merchandise booth – not to buy anything, but hoping they would show up there, which they eventually did. I got both CD-booklets signed and got into a really cool conversation with guitarist Alex and bassist Miranda, mostly about Thrash Metal and the glorious days of the eighties when they were just little kids or not even born yet. I had to ask them if they knew Dawn Crosby (not in person, of course) and it turned out that they both were huuuuge fans of her! Alex even had the Détente-logo on his jacket – I think he said that Miranda had painted it for him. I had to tell them how I had gotten into written contact with Dawn Crosby (even though only for a short time) way back in the nineties. I also asked them – among other things – if they knew Sacrilege (the female-fronted Thrash Metal band from the UK) and Znowhite. They told me they had heard some songs by Sacrilege and also Znowhite‘s „Hell Bent“. I was, of course, prepared just in case, so it seemed it was a very positive surprise for them when I first handed them a copy of the Sacrilege-CD featuring “Within The Prophecy” and “Behind The Realms Of Madness” (a CD-R, not the original, of course) and then a copy of Znowhite’s “Act Of God”. I really love such moments when I can give some of my favourite musicians some stuff (mostly CDs) I’m quite sure they will like. I also mentioned to Alex that I would like to see them at the Metal Female Voices Fest and he told me that their record label Napalm Records had already suggested to them that they should send in their application, since Napalm Records are one of the sponsors of this festival. It would be so cool, if I should actually get the chance to see them there again in October! I also asked Alex for his e-mail-address so we can stay in contact and I can recommend him more old school Thrash Metal he might not have heard yet. E.g. when I mentioned Anacrusis and Hexenhaus to him, he said he hadn’t heard them yet. 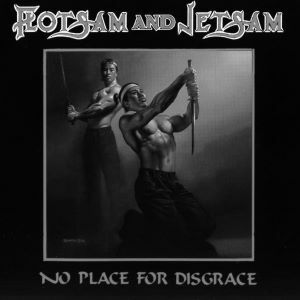 Back to the concert: Flotsam & Jetsam were the second band to play. The first and so far also last time I had seen them live was way back in 1988 when they were supporting Megadeth together with Sanctuary and Testament (what a great line-up!) at the Grugahalle in Essen. I only have got their first two albums and even though I listen to them very rarely nowadays, I still like them – especially the bass-playing on “Doomsday For The Deceiver”. I think Flotsam & Jetsam didn’t play much longer than half an hour, either – I missed the beginning of their set, because I was still talking to Alex. When I was inside the venue again, I got to hear – in addition to a newer(?) song, which didn’t impress me that much – “Hammerhead” and “Iron Tears” from their debut and two of my favourite tracks from “No Place For Disgrace”, namely the title track and “I Live, You Die” – that was simply fantastic! After they had left the stage, I went back to the merchandise booth to continue my conversation with Alex and Miranda until they said they had to leave for a while to eat something and have a shower. They said they might be back by the end of Sepultura’s gig. The third band playing this evening were Legion Of The Damned, a newer band I hadn’t heard before. They sounded darker and less melodic and the vocals were more extreme. It was still bearable, though. 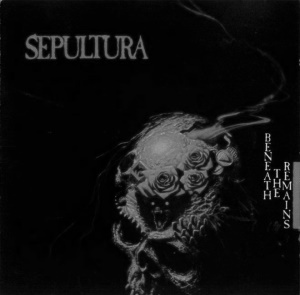 While I do have two of Sepultura’s albums – “Beneath The Remains” and “Arise” – and think they are quite okay (I haven’t listened to them for a very long time now), they have never been one of my favourite bands. And this concert didn’t change this. I have to say that I found Sepultura’s set very tiring and more than once nearly unbearable. The vocals sounded most of the time like monotonous screaming without any melodies at all – the same goes for the music. Even the three or four songs (?) from the two albums I have got, sounded far less enjoyable than the album version. If I hadn’t wanted to meet the guys and girls of Mortillery again, I would have left earlier. After Sepultura had finally finished their set, I spotted Alex from Mortillery once again and we talked again for another 30-45 minutes, occasionally interrupted by other fans who wanted to get some stuff signed, have a picture taken with the musicians and also exchange a few words with them. Before I eventually left at about a quarter to midnight, I told Alex that the running order had been wrong and that it should have been the other way round. And I really mean this seriously. I really enjoyed Mortillery the most, followed by Flotsam & Jetsam. Legion Of The Damned were still okay, whereas I really would have liked to skip Sepultura. 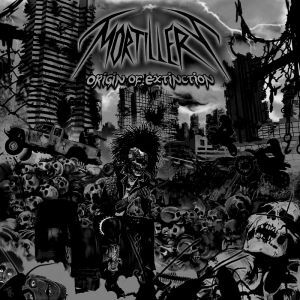 Das letzte Mal, dass ich an einem neuen Thrash Metal Album soviel Spaß wie an Mortillerys „Murder Death Kill“ (und dem Nachfolger „Origin of Extinction“) hatte, muss mehr als 20 Jahre her sein. Als sie daher eine Europatour als Support für Sepultura ankündigten, war ich sehr erfreut, als ich sah, dass sie auch in Deutschland auftreten würden. Ich kaufte mir eine Karte für das erste Konzert der Tour in Bochum am 07.02.2014. Obwohl ich schon 5 Minuten vor dem angekündigten Konzertbeginn (18:30 Uhr) in der Halle war – auf dem Weg dorthin hatten mich einige kleinere Staus aufgehalten -, hatten Mortillery bereits angefangen. Ich glaube, ich habe noch so ca. 25 Minuten mitbekommen und nehme daher an, dass ich nicht zuviel verpasst habe. Der Sound war gut und das Konzert hat mir wirklich Spaß gemacht. Ich erinnere mich nicht mehr an alle Songs, die sie gespielt haben, aber „No Way Out“, „Maniac“ (einer meiner Lieblingssongs vom aktuellen Album) und „I Am Destruction“ (der – obwohl es sich um einen der stärksten neuen Songs handelt – nur auf der Vinylversion von „Origin Of Extinction“ zu finden ist, wofür man den Verantwortlichen bei der Plattenfirma die Ohren langziehen sollte!) waren darunter, ebenso ein neuer Song, „Radiation Sickness“ (nein, keine Coverversion des gleichnamigen Songs von Nuclear Assault), der auf dem dritten Album zu hören sein soll. Mein erster Eindruck des neuen Songs war sehr positiv. Nachdem Mortillery die Bühne verlassen hatten, begab ich mich in Richtung des Merchandisestandes, jedoch nicht, um etwas zu kaufen, sondern in der Hoffnung, dass die Musiker dort auftauchen würden, was schließlich auch geschah. Ich ließ mir beide CD-Booklets signieren und hatte eine tolle Unterhaltung mit Gitarrist Alex und Bassistin Miranda, hauptsächlich über Thrash Metal und die glorreichen Tage der Achtziger, als die beiden noch kleine Kinder oder noch nicht einmal geboren waren. Ich musste sie natürlich fragen, ob sie Dawn Crosby kennen (natürlich nicht persönlich) und es stellte sich heraus, dass beide große Fans von ihr sind! Alex hatte sogar ein Détente-Logo hinten auf seiner Jacke – ich meine, er sagte, dass Miranda das für ihn gezeichnet hätte. Ich musste ihnen dann natürlich auch erzählen, wie ich in den Neunzigern in Briefkontakt mit Dawn Crosby gekommen bin (auch wenn es nur für eine kurze Zeit war). Ich fragte sie dann u.a. auch, ob sie die britische Thrash Metal-Band Sacrilege kennen würden und Znowhite. Sie sagten mir, dass sie ein paar Songs von Sacrilege gehört hätten und auch Znowhites „Hell Bent“ hätten. Ich war natürlich für diesen Fall vorbereitet, und so schien es eine sehr positive Überraschung für sie zu sein, als ich ihnen zunächst ein Exemplar der Sacrilege-CD mit den Alben “Within The Prophecy” und “Behind The Realms Of Madness” (natürlich eine CD-R, nicht das Original) und dann ein Exemplar von Znowhites “Act Of God” überreichte. Ich liebe solche Momente, wenn ich einigen meiner Lieblingsmusiker etwas (meist CDs) geben kann, bei dem ich relativ sicher bin, dass sie es mögen werden. Ich sagte Alex auch, dass ich sie gerne beim Metal Female Voices Fest sehen würde, und erwiderte, dass bereits ihre Plattenfirma ihnen vorgeschlagen hätte, sich dort zu bewerben, da sie zu den Sponsoren des Festivals gehört. Es wäre toll, wenn ich tatsächlich die Gelegenheit bekommen sollte, sie dort nochmals im Oktober zu sehen! Ich fragte Alex dann nach der E-Mail-Adresse, um mit ihm in Kontakt bleiben zu können und ihm vielleicht einige weitere Bands, die er eventuell noch nicht gehört hat, empfehlen zu können. Als ich z.B. Anacrusis und Hexenhaus erwähnte, sagte er, dass er diese noch nicht gehört habe. Zurück zum Konzert: Flotsam & Jetsam spielten als zweite Band. Das erste und zugleich letzte Mal, dass ich sie gesehen hatte, war 1988 gewesen, als sie als Vorband von Megadeth auftraten, zusammen mit Sanctuary und Testament (was für ein tolles Line-Up!) in der Grugahalle in Essen. Ich habe nur ihre beiden ersten Alben, und auch wenn ich diese heutzutage nur noch selten höre, mag ich sie immer noch, vor allem das Bassspiel auf „Doomsday For The Deceiver“. Ich glaube, Flotsam & Jetsam haben auch nicht viel länger als eine halbe Stunde gespielt – ich habe den Anfang ihres Sets verpasst, da ich mich immer noch mit Alex unterhielt. Als ich wieder in der Halle war, habe ich noch neben einem neueren (?) Song, der mich nicht sonderlich beeindruckt hat, „Hammerhead“ und „Iron Tears“ von ihrem Debüt und zwei meiner Lieblingssongs von „No Place For Disgrace“, nämlich den Titelsong und „I Live, You Die“, mitbekommen – das war einfach fantastisch! Nachdem sie die Bühne verlassen hatte, ging ich zurück zum Merchandisestand, um meine Unterhaltung mit Alex und Miranda fortzusetzen, bis sie schließlich meinten, dass sie mal für eine Weile verschwinden müssten, um etwas zu essen und zu duschen. Sie sagten noch, dass sie wohl gegen Ende von Sepulturas Auftritt wieder zurück sein würden. Die dritte Band an diesem Abend waren Legion Of The Damned, eine neuere Band, die ich bislang nur vom Namen her kannte. Sie klangen düsterer und weniger melodisch und der Gesang war extremer, aber es war immer noch erträglich. Wenngleich ich zwei von Sepulturas Alben – “Beneath The Remains” und “Arise” – habe und sie auch ganz OK finde (ich habe sie schon sehr lange nicht mehr gehört), haben sie nie zu meinen Lieblingsbands gehört. Daran hat auch dieses Konzert nichts geändert. Ich muss sagen, dass ich Sepulturas Set sehr anstrengend und mehr als einmal beinahe unerträglich fand. Der Gesang klang die meiste Zeit wie monotones Schreien ohne jegliche Melodien, die mir auch bei der Musik fehlten. Selbst die drei oder vier (?) Songs von den beiden Alben, die ich habe, klangen live weit weniger unterhaltsam als die Albumversionen. Wenn ich nicht die Musiker von Mortillery noch einmal hätte treffen wollen, wäre ich vorzeitig abgehauen. Nachdem Sepultura endlich ihren Auftritt beendet hatten, sah ich Alex von Mortillery wieder und wir unterhilten uns noch weitere 30-45 Minuten, gelegentlich unterbrochen von anderen Fans, die etwas signiert haben, sich mit den Musikern fotografieren lassen und auch mit ihnen ein paar Worte wechseln wollten. Als ich schließlich gegen viertel vor Zwölf ging, sagte ich Alex noch, dass die Running Order falsch gewesen wäre und genau anders herum hätte sein sollen. Und das ist mein Ernst. Mortillery haben mir wirklich am besten gefallen, gefolgt von Flotsam & Jetsam. Legion Of The Damned waren noch OK, während ich auf Sepultura gerne verzichtet hätte.